A restorative dentist from Plymouth University Peninsula School of Dentistry has won a prestigious award from the British Society of Restorative Dentistry. Angharad Truman is a speciality registrar in restorative dentistry and a registered Plymouth University student on its MSc in Restorative Dentistry course. 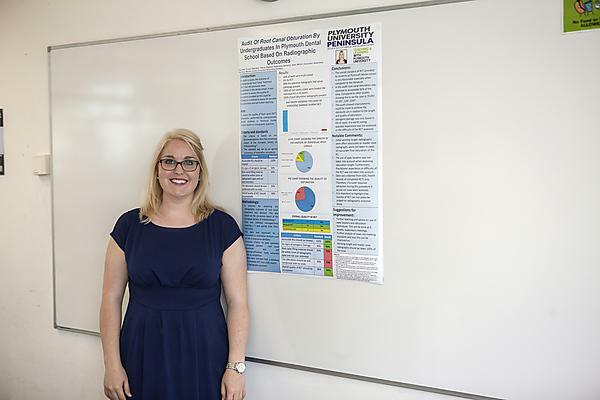 She has been awarded the 2016 British Society of Restorative Dentistry Poster Presentation Prize (Clinical Audit). Angharad carried out an assessment of root canal procedures undertaken by dental students at Plymouth University Peninsula School of Dentistry. Dental students treat NHS patients as part of their studies, under the supervision of qualified dental professionals across purpose-built Dental Education Facilities in Exeter, Plymouth and Truro. The study found that the success of root canal procedures carried out by dental students compared favourably with other national figures. Plymouth University dental students achieved a standard of acceptability of 92 per cent, compared with national statistics which range from 13 per cent to 79.4 per cent.